Do you wear a bracelet – is it a Golden one or made of some other metal ? ~ wearing them on arms start perhaps from the hospital bed as identification tag… to the stunning jewelry pieces….. made of Gold, other metals, to the modern day metal, leather, cloth, plastic, wood, shells, and more………. In religion, also bracelets have some significance – in Temples those who perform Yagnyas have bracelet known as ‘kappu’. Many of us do display our emotions and become emotionally charged when something pleasant or unpleasant happens. Emotion is the complex psychophysiological experience of an individual's state of mind as interacting with biochemical (internal) and environmental (external) influences. In humans, emotion fundamentally involves "physiological arousal, expressive behaviors, and conscious experience." Emotion is associated with mood, temperament, personality, disposition, and motivation. Psychologically, we look to external sources for some support and kappu or bracelets are one of the means from which mankind derives solace. In most religious places, you could see – ‘black and red strings’ being purchased and worn as ‘bracelets’ or around the neck to ward off evil. In Sanskrit, it is called "drishti dosha" meaning malice caused by Evil eye. Throughout the World, the wearing of charms as a form of amulet/ talisman to ward off evil spirits or bad luck is prevalent. Then came the charm bracelets in various forms believed to bring good luck and personal things to the wearer…. Moving away from the power balance, there is news of iBracelet that can tell you when you've got an email from your boyfriend (or when your favourite celeb sends a new Tweet). It is a bracelet of technology – one that pairs with mobile phones as it controlled via an application – just like the ‘Attention Indicator’ that you have on Lotus Notes by which you can customize the background and text colours of people [you like or your bosses or those whom you consider extremely important], this iband can be programmed to display different colours for different people and would display alerts based on tweets and Facebook alerts. Daily Mail of 4th Mar 2013 carried an interesting report on this. It may not be quite as sophisticated as the rumoured iWatch, but a new £30 bracelet aims to tell you when your wife is calling, or when your favourite celebrity has tweeted. The Embrace+ connects via Bluetooth to an iPhone or Android handset, and can be programmed to flash with different colours when a particular person emails, tweets or sends a Facebook message. Its inventors claim it is perfect for those who can't bear to put their phone in their pocket. The bracelet, called Embrace+ is set to to on sale later this year - and owners can assign friends colours so they always know who is calling or emailing - even if their phone is in their pocket. The bracelet uses Bluetooth to communicate with a mobile phone, and is set up using a special app. Its makers claims almost any colour can be displayed from the 'colour wheel' in the accompanying app. 'Embrace+ is for those who have a busy lifestyle, and want to stay connected with their smartphones,' the firm says. Many are impatient and keep checking their smartphones for e-mails, tweets and updates, especially from their beloved ones…….. it could be matter of laugh and a comic sight for others to see from outside – but factually many are addicted to this. You can observe that some driving on a 2 wheeler, when forced to stop due to signal, would instantaneously take out their mobile and check for message / e-mail. 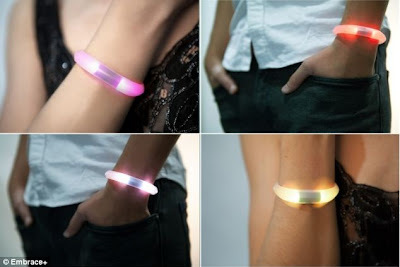 A Company has decided to cash on this bringing up a solution – that of a ibracelet ~ one that can display almost any colour, with each being assigned to a person or action via a special app for Android and iOS devices. The makers say that the bracelet will last for 10 days on a single charge, and is expected to show around 100 alerts a day to the average user. The design, available in three shapes, is based on a gemstone. Its makers claim that each design comes in 3 different sizes that fits both men and women at any age. The battery of embrace+ can be recharged through the cable that comes along; it is stated that charging time for a full charged battery via laptop is only 10minutes. It is claimed to be waterproof so that it can be worn under the shower, when it rains and even in a swimming pool. So what are you waiting for………. Buy and know that you have e-mail waiting, immaterial whether you read all the e-mails that you receive and when you respond to any of them.